To enter the concert hall at the Barn at Flintwoods is to greet the Baroque era in all its gilded magnificence. Not only a performance and recording venue, the space houses a treasured private collection of antique harpsichords. The collection, ranging from several Ioannnes Ruckers models, a 1707 Nicholas Dumont and a Spanish-made harpsichord, has been carefully restored both mechanically and aesthetically. Each is meticulously decorated with pastoral scenes, flying cherubs, and even shrimp waiting patiently to be consumed. The most recent acquisition – a harpsichord made by Ruckers in 1627 – was unveiled at Brandywine Baroque’s Dumont Concerts, a weekend-long harpsichord “festival”, which concluded on Sunday, May 24. The Dumont Concerts opened with a wonderful recital by Karen Flint, Artistic Director of Brandywine Baroque. She played several instruments in the collection, taking us on a musical journey both around the room and world. Striking is Ms. Flint’s knowledge of performance practice and musicology. Her program included two works by Elizabeth Jacquet de La Guerre (1665-1729), a composer and court musician for Louis XIV. Ms. Flint played these virtuosic, sometimes contemplative, movements with grace and skill. The evening ended with Davitt Moroney on the 1635 Ruckers harpsichord, joining Ms. Flint in a “four hands” duet by François Couperin (1668-1733). Olivier Baumont performed a program entitled “Les Clavecinistes versaillais”. An exceptional artist and scholar, Mr. Baumont played works by eight different composers who performed at Versailles, including Couperin, Jean-Phillip Rameau, and an eight-year-old Mozart. After each piece, Mr. Baumont applauded the instrument he had played, reminding us how special and important each of the harpsichords is at the Barn at Flintwoods. A free sample of the Delaware Symphony Orchestra's next season is available on CD, just by asking. The "Listen Local" CD previews the DSO and its guest artists in the repertoire of the 2009-2010 classical series. Conductor David Amado also recorded a friendly and informative conversation with host Mark Mobley about the musical juxtapositions in each concert. They talk about lesser-known works of Mozart, Beethoven and Stravinsky to ever-popular Grieg, Dvorak, Samuel Barber, Aaron Copland and Kurt Weill. Mark Mobley is the DSO's director of community engagement and frequent narrator. E-mail him at markm@delawaresymphony.org to request a copy of the audio guide. A complete brochure also lists the coming children's and pops concerts at the Grand Opera House in Wilmington, plus the champagne chamber series at the Hotel du Pont Gold Ballroom. The Delaware Symphony Orchestra opens Sept. 25 and 26 with a piano showcase contrasting Gershwin, Ravel and Rachmaninov. The preview CD even has an excerpt of Rachmaninov himself playing his concerto. The sixth “American Tapestry” concert of the New Ark Chorale was played without light. The power at the Newark church cut out ten minutes after the singing began and no one – including Music Director Michael Larkin, the singers, or the pianist missed a lick. The song was How Can I Keep From Singing? Pianist Wendy McNally played on in fading light and missed not a note as enthusiastic volunteers waved bright flashlights onto her music. Her playing was excellent the entire time. If your eyes had been closed you would not have known anything was amiss. Kevin Muccheti, a high school senior, won the New Ark Chorale scholarship and played Chopin’s Polonaise Opus 26, No. 1 in the dark as well – to great applause. The New Ark Chorale presented him with a check for $2,500 toward his music education studies. a surprising arrangement by John Rutter with some great ragtime phrases for pianist Wendy McNally. The second half of the concert saw the chorale at the back of the church allowing the singers to take advantage of the last bits of daylight for Larkin’s rearrangement of some of Ray Conniff’s famous love song medleys. By the time the lights went back on, the audience had been won over by the great efforts to keep the show going. They happily joined in and sang along with the last few choruses. At 8 p.m. June 5, the Melomanie ensemble will present a joint benefit concert with the justice advocacy group Pacem in Terris. Known for intriguing programs combining early period music and new commissions, Melomanie’s round-the-world itinerary features local composers Chris Braddock and Mark Hagerty. Works by Telemann, J.S. Bach, Diego Ortiz and Astor Piazzolla are also in the mix. The concert is at Grace United Methodist Church, 900 Washington St., Wilmington. For tickets, call (302) 764-6338 or see www.melomanie.org. The evening coincides with the 20th SOWETO Festival art exhibit in the Grace Church gallery. A reception with poetry runs from 5 to 7:30 p.m. This is also a city Art Loop night. Alla rāga is the third of five movements that make up my third harpsichord suite. Many pieces of music historically have been given similar titles or indications — Marcia alla turca (Turkish March), Alla danza tedesca (like a German dance) —which inform the listener of the inspiration or intent of the piece and give the performer an indication of how it should be played. In this case, the type of music referenced is the classical music of India, typically executed on sitar with tablas (characteristic Indian drums). The incongruous Indian-inspired music in a harpsichord suite is a take-off on the Baroque tradition of including different national styles (and sometimes exotic elements) in pieces. Often, past composers’ understanding of the music of other cultures was incomplete, and the result of their borrowing was more an expression of the composer’s native style than a close approximation of the admired (or parodied) model. But that very misunderstanding is often productive, and the result offers something new. My fascination with and affection for Indian music goes back decades. On the occasions when I have traveled to India, I have made it a point to spend at least one night at a sitar performance. I wanted to take my Western ears’ impressions to develop a wholly new kind of piece for the harpsichord. Two essential characteristics of the sitar are its (by Western standards) complex tuning and its bending of pitch for melodic, ornamental and expressive purposes. Because the harpsichord, tuned and played normally, cannot produce either of these effects, I developed some new “ornaments” (additional rapid notes that embellish the melody) that seem to give the effect of bending pitch in the piece. Another essential characteristic of the sitar is the droning pitches, which do not change. This harpsichord can accomplish this effect, and by giving the drone pitches rhythmic motion as the piece progresses, I was able to provide some of the rhythmic drive supplied by the tablas. Both sitar and harpsichord are plucked (one by hand, one mechanically), and both have an insistent tone. So while they are widely separated by geography, design and tradition, they do have some common traits, which is what suggested this music. The Delaware Art Museum has the perfect exhibit to see before traveling to southern Delaware this summer as many of the crafters are alive and well and ready to show and sell other works. 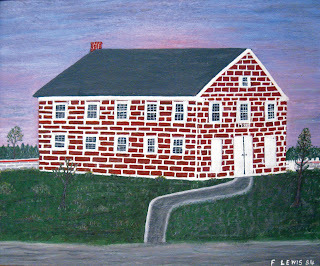 The show was organized in collaboration with the Delaware Folk Art Collection, a program of Delaware State Parks. Bright reds and daringly asymmetrical patterns stand out in a quilt made by Elaine Bahr and Elaine Bordley of Dover which hangs in the main entryway to the museum. “Bright and Lively” hangs next to a more traditional quilt called “Malia Obama’s pretty ribbons” done by Elaine Bordley alone. The colors reflect the bright fashion worn by the President’s younger daughter at the January inauguration. Upstairs is a quilt within a quilt by Ann Martin of Dover. She incorporated the quilting used as markers for slaves on the road to freedom through the Underground Railroad into her quilt depicting the slaves approaching a safe house. “Safe House” is more than needlework – it is a commentary on our country’s political and racial history. The yellow tones of Nina Spencer’s tile with acrylic, “Freedom Town”, provide a dramatic background to multilayered portraits of African Americans. Jehu F Camper (1897-1989) of Harrington carved entire farm scenes of wood depicting farm life in the early 1900s. One shows sheriffs invading the barnyard and police dogs chasing moon shiners as they dive beneath the barn. Guest curator Carol Balick has really brought some gems from the Diamond State to the forefront. Out of the Commonplace: The Folk Art of Delaware runs through August 16. Guest director John Going played up the signature wit with theatrical affectations and period politesse for delicious sight gags. The cast, costumes and country-house set were all spot-on in the sumptuous new Thompson Theater. Artistic director Sanford Robbins offered a teaser for this autumn. The opener will be “I Am My Own Wife” by playwright Doug Wright. This daring World War II survival story swept the 2004 Tony, Pulitzer Prize and just about every other drama award after its Broadway debut. As one of the mothers of the Wilmington Children’s Chorus said at the spring concert, “There is no one that David Christopher doesn’t know.” Christopher was her first voice teacher 15 years ago and now she drives her daughter to rehearsals from West Grove, Pa.
David Christopher balances like an expert – playing harpsichord for the Delaware Symphony, conducting operas, directing choirs and orchestras. His Christmas concerts at the Episcopal Church of Saints Andrew and Matthew combine sacred 16th-century polyphony with Caribbean jazz carols lets the congregation express their joy of diversity and community. 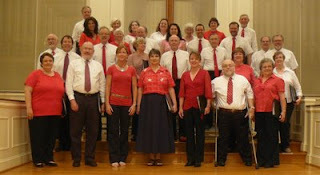 He has taken over the Delaware Valley Chorale and honed it into a skilled and dedicated group. 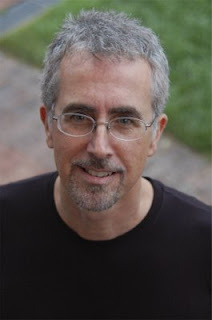 Christopher has also directed the Wilmington Children’s Chorus since 2002. He is a singer, organist, harpsichordist, classical and gospel pianist – but his real talent is to patiently turn the pitch- and rhythm-challenged into willing performers and listeners. The spring concert of the Wilmington Children’s Chorus on May 17 was an eye-opener. When more than 90 children have memorized the Italian lyrics to a song by a 17th-century German composer and sing with gusto, something good is happening. David Christopher has built a choir of some one hundred kids from the city and suburbs, even out of state, and ranging in age from 8 to 18. The City of Wilmington’s CITYFEST Office is the sponsor. Kimberly Doucette led the Chamber Choir in songs by Monteverdi, Handel and Lefevre. Chrystal Hass led the entire chorus in a traditional South African song which was moving in an a capella style similar to Ladysmith Black Mambazo. Damala Haire sang the solo for “I Got Rhythm” by Gershwin. Her voice is pure and strong, and she performed with the ease of a professional. Pianist Hiroko Yamazaki accompanied the choir and Johnathan Whitney provided percussion, with assistance from Philip Doucette, the chorus manager. Wilmington Children’s Chorus is also performing at the Grand Opera House at 3 p.m. June 21, and will be joined by some of the jazz artists in the 20th annual DuPont Clifford Brown Jazz Festival. That concert is free and open to the public. Wilmington’s Children’s Chorus is holding a day camp for musicians from July 13 through 17 for children having completed grades 2 through 8. The camp runs from 9 a.m. to 4 p.m., with music all morning, lunch, a little more rehearsal, then swimming, movies and other recreation. There is still financial aid available.